Some South Bay water customers say they are paying four times what they paid during the last billing cycle. San Jose Water customers from Campbell, Saratoga and Los Gatos say they are using a lot less water, but are seeing skyrocketing bills. "A lot of us put a lot of effort to get our usage down only to see our bills increase," Los Gatos-resident Uday Nagendran said. 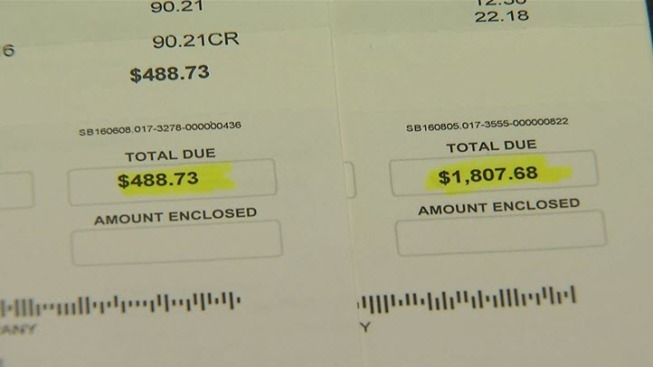 One customer, Lainey Richardson of Los Gatos, was recently slapped with an $1,800 water bill even though she says her "lawns are dead and screaming for water." Candice Tuttle, who lives in Campbell and cares for her elderly mother, saw a 48 percent increase in her latest bill. "To be able to handle that on a fixed income is devastating," Tuttle said. John Tang, San Jose Water Company spokesman, says all customers will see a hike up to 20 percent due to several rate hikes. "On June 14 the CPUs granted an 8.6 percent rate hike that was retroactive to January 1," Tang said. Tang also said on July 1, wholesaler Santa Clara Valley Water District raised rates 20 percent, which meant a 6.7 percent rate for customers. Tang said the additional costs also include if water customers' usage for the summer months and the new tiered pricing for people that use more than their water allotment. While Richardson's bill does indicate she went over her allotment, she said it still does not add up to a 250 percent increase.